Israel Book Shop presents Chapter 26 of a new online serial novel, Divided Attention, by Esther Rapaport. Check back for a new chapter every Thursday or Friday. Click here for previous chapters. “Morah?” Nava said as she passed Ayala near the door. “In the dumpster?” Ayala was surprised at the very idea. Nava hesitated. All she needed was for the girls spending their recess outside to see her and Morah Ayala striding together through the schoolyard and out the gate to begin rummaging in the garbage dumpster. If she was right, then at least she would be vindicated and everyone would understand the reason for their little foray. But what if she wasn’t right? And besides, she didn’t really want to be the topic of discussion as they searched, irrespective of whether their search turned anything up or not. Ita asked the janitor to go over to the huge green dumpster and use the mop stick to see if the journals were in there. He did as instructed, and after several long moments of being observed by an audience of gaping high-schoolers glued to the chain-link fence, the mop stick turned up a familiar green binding, sans papers. “That’s it!” Ita said excitedly. “Do you see any papers, Mr. Shimshon?” she called. He pulled out a pair of latex gloves and put them on. Then he hoisted himself onto the edge of the dumpster and stuck his hands inside the heap. 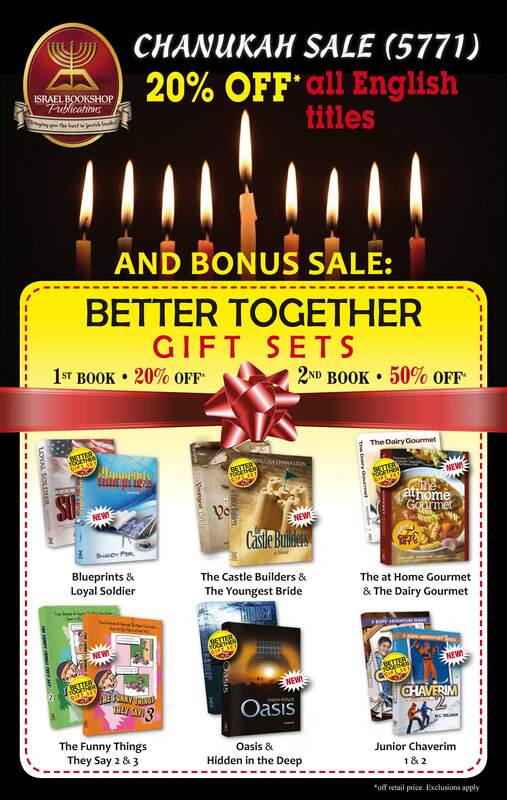 Israel Book Shop presents Chapter 25 of a new online serial novel, Divided Attention, by Esther Rapaport. Check back for a new chapter every Thursday or Friday. Click here for previous chapters. The moon cast a dim glow on the dirt path, doing little to illuminate it. It was a tiny, end-of-the-month moon, trying valiantly to peek at what was going on down below, near a low building. Six figures stood at the edge of the courtyard, under a small awning. “Another minute and I’ll have it open,” Shai reassured him hurriedly. “Yep.” Ronny was engrossed in Shai’s efforts. Psst! 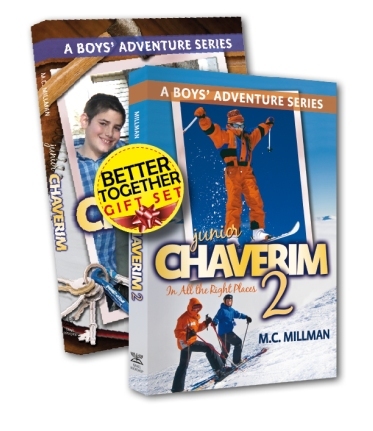 Looking to give your kids lots of giggles and fun this Chanukah? There’s an easy way to do it, and it’s becoming available as of today: Buy a copy of the newest The Funny Things They Say. 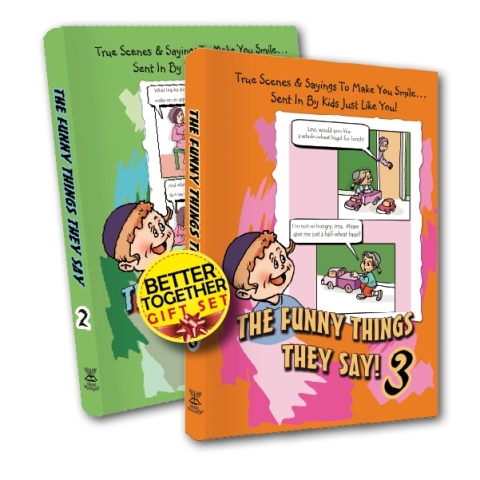 The third book in this hilarious series, The Funny Things They Say 3 is guaranteed to provide hours of rollicking laughter in your home, as you and your kids read and relish the adorable quotes said by other kids. Kids really do say the cutest things, and the funniest thing is that oftentimes, it is the kids themselves who see the hilarity most in their quips and sayings! 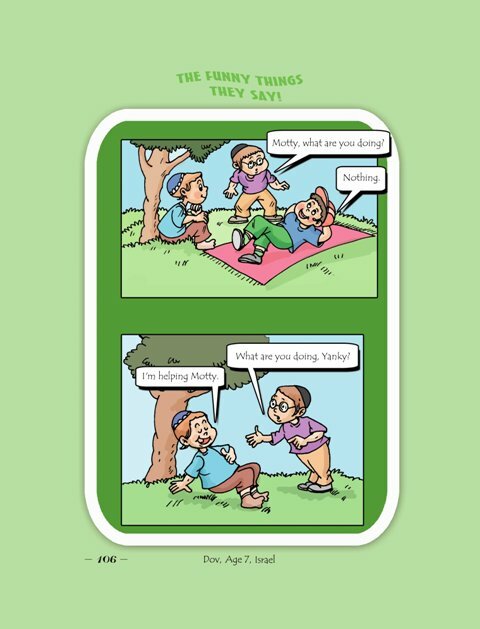 The Funny Things They Say captures the unadulterated humor of children in its adorably illustrated pages. Countless parents like you have seen the joy and excitement generated among their children by The Funny Things They Say series. Buy The Funny Things They Say 3, and you, too, will have joined the club of happy parents. Because, as well all know, happy kids create happy parents! Click on these thumbnails for a preview. Israel Book Shop presents Chapter 24 of a new online serial novel, Divided Attention, by Esther Rapaport. Check back for a new chapter every Thursday or Friday. Click here for previous chapters. Rafi usually opened his eyes as soon as he heard Yael’s voice in his room each morning. Today, however, Rafi’s eyes remained closed. Yael called his name repeatedly until the lump under the covers began to rustle. But when she came back five minutes later, he was still under the covers, deeply asleep. “Rafi, are you feeling okay?” Yael asked worriedly. 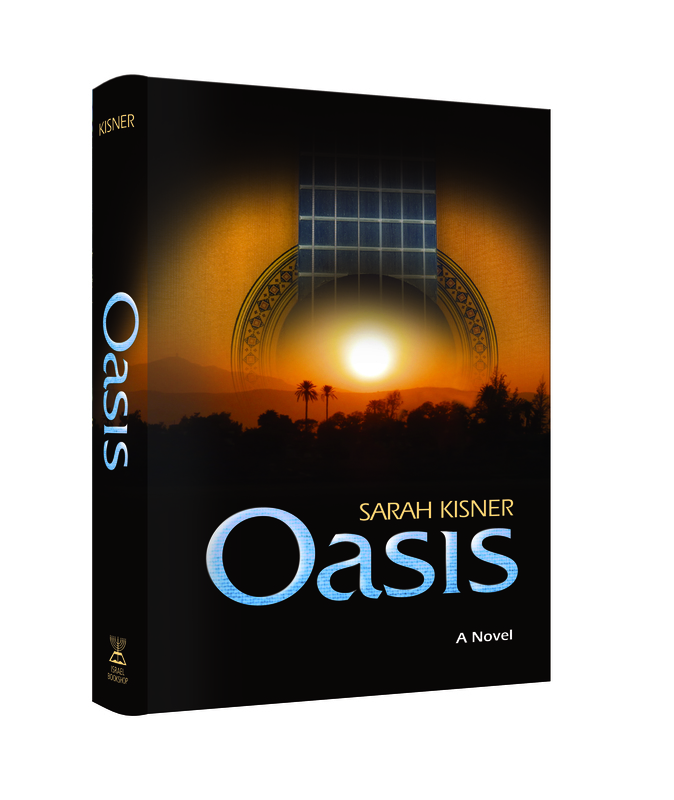 As soon as she closed the door, Rafi unclenched his fist. A large part of the crumpled tissue in his hand was red, but the blood on the cut had already congealed. Puti had said that he doubted any glass had gotten into the cut, but that next time they broke a window, they would first take out the glass that remained stuck in the frame before Rafi would climb through. I wish there wouldn’t be a next time! I wish Ronny would forget about me, once and for all! Or that they would decide that they don’t want me in their club! Rafi thought. He had hardly done anything; he had just climbed into the stairwell window and opened the building door from the inside for them. It was a huge wooden door that could only be opened with a key or through the intercom system. They had begun spraying paint on the walls until there was an awful smell. Ofer had offered him his spray-paint can, but Rafi had declined. Eddie spilled tons of sand and water on the steps and asked him if he wanted to draw pictures in the sand. He didn’t. He just sat and made sure that Ronny wasn’t drawing people sticking their tongues out, like he had promised. 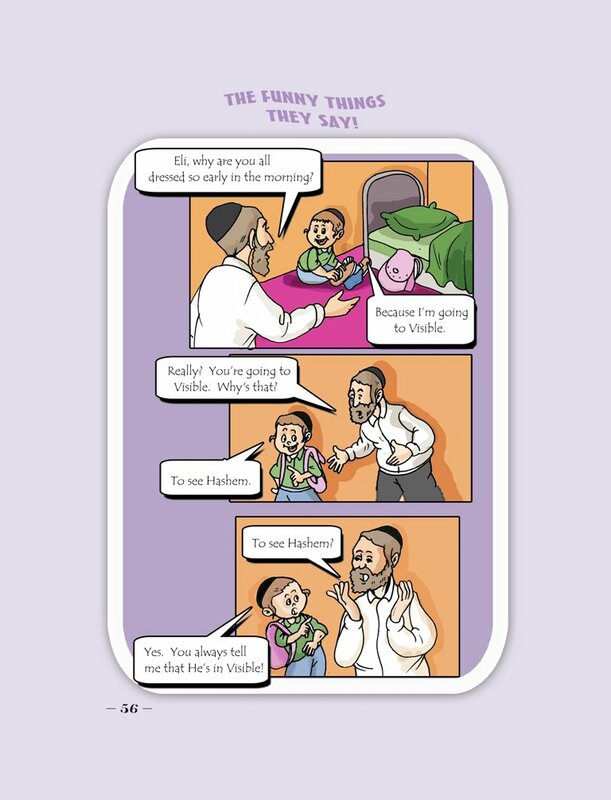 He didn’t want Rabbi Paksher to hear about what they had done and piece together that he was connected to the incident.